Our brand new 6Ft Pre-Lit Christmas Tree is an ideal Christmas trimmings. Tree is Decorated with 230 energy saving UL-certified LED lights and multi-colored fiber optics. The LED lights will present changeable white and warm white color with 8 light pattern options by an adjusting button for adding a fantastic festive atmosphere. Our trees are in great quality, making it your best choice. The foliage, made of fade and crush resistant PVC needles, appears fresh-cut. The tips are sculpted to enhance the trees' lifelike appearance. In addition the staggered branches give the tree a fuller profile. Metal bases to keep the tree planted in an upright position. Add some festive to your home with this Christmas tree. Don't hesitate to buy it! 8 Flash Modes - Goplus Pre-lit christmas tree has 8 different colorful flash modes, like combination, waves, sequential, flash and so one. You may choose appropriate mode with an adjusting button and the light color of optical fiber will change as well. 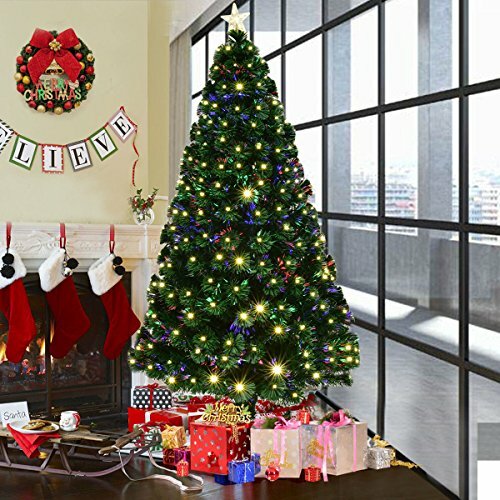 Pre-lit with Electrodeless LED Lights - This christmas tree is pre-lit with optical fiber tubes and low voltage electrodeless LED lights with 7 different colors, these electrodeless LED lights are energy-efficient and long lasting. All the lights of optical fiber will keep lighting only with the open of light source, even without the LED light. Pre-lit design saves your time to set up electric lines, you just need to put your favourite decorations on the tree.